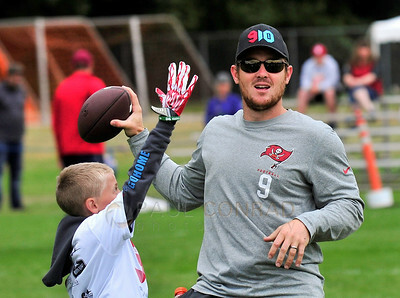 Tampa Bay Buccaneers kicker Michael Koenen passes the ball while scrimmaging with participants of Michael Koenen/Jake Locker Charity NFL Kids Football Camp at Ferndale High School in Ferndale, Wash., on Sunday morning July 20, 2014. 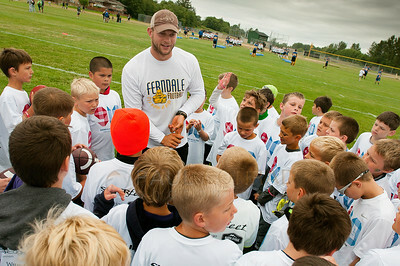 The camp is held annually and hosted by Tennessee Titans quarterback Jake Locker and Koenen, both graduates of Ferndale High School. 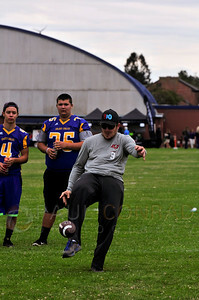 Tampa Bay Buccaneers kicker Michael Koenen punts the ball during kicking practice of the Michael Koenen/Jake Locker Charity NFL Kids Football Camp at Ferndale High School in Ferndale, Wash., on Sunday morning July 20, 2014. The camp is held annually and is hosted by Locker and Tampa Bay kicker Michael Koenen, both graduates of Ferndale High School. 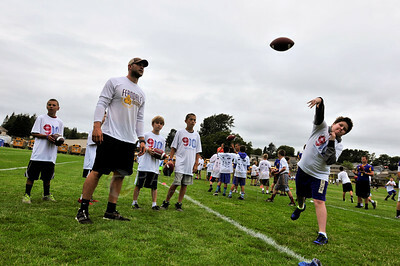 Tennessee Titans quarterback Jake Locker observes Nathan Sosaya, 9, of Lynden, practice his throwing during the Michael Koenen/Jake Locker Charity NFL Kids Football Camp at Ferndale High School in Ferndale, Wash., on Sunday morning July 20, 2014. 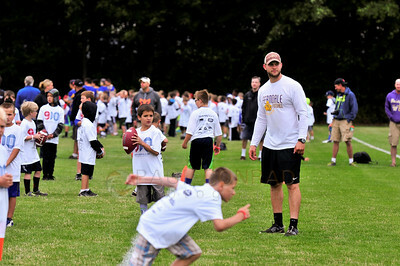 The camp is hosted by Tampa Bay kicker Michael Koenen and Tennessee Titans quarterback Jake Locker. 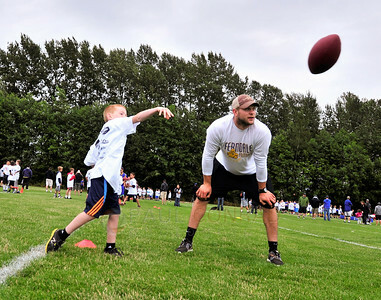 Tennessee Titans quarterback Jake Locker, right, observes a youth during throwing practice of the Michael Koenen/Jake Locker Charity NFL Kids Football Camp at Ferndale High School in Ferndale, Wash., on Sunday morning July 20, 2014. The camp is held annually and is hosted by Locker and Tampa Bay kicker Michael Koenen, both graduates of Ferndale High School. 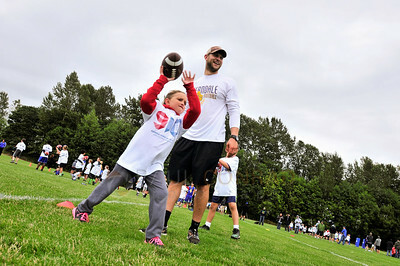 Tennessee Titans quarterback Jake Locker, right, observes Kenna Andersen, 8, of Bellingham, during throwing practice of the Michael Koenen/Jake Locker Charity NFL Kids Football Camp at Ferndale High School in Ferndale, Wash., on Sunday morning July 20, 2014. Andersen said she was having fun and the most important thing she learned was how to catch the ball. The camp is held annually and is hosted by Locker and Tampa Bay kicker Michael Koenen, both graduates of Ferndale High School. 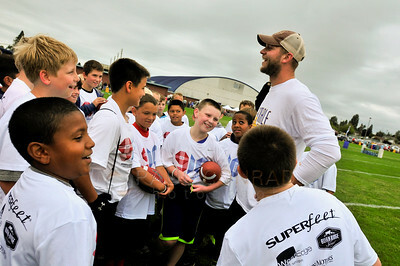 Tennessee Titans quarterback Jake Locker gives a post-practice pep talk to youths during the Michael Koenen/Jake Locker Charity NFL Kids Football Camp at Ferndale High School in Ferndale, Wash., on Sunday morning July 20, 2014. The camp is held annually and is hosted by Locker and Tampa Bay kicker Michael Koenen, both graduates of Ferndale High School. 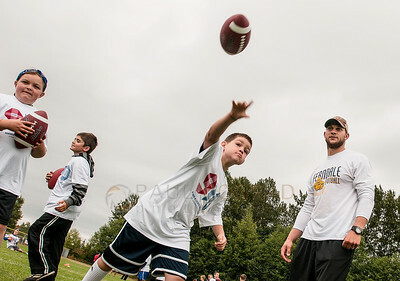 Tennessee Titans quarterback Jake Locker instructs youths during throwing practice of the Michael Koenen/Jake Locker Charity NFL Kids Football Camp at Ferndale High School in Ferndale, Wash., on Sunday morning July 20, 2014. The camp is held annually and is hosted by Locker and Tampa Bay kicker Michael Koenen, both graduates of Ferndale High School. 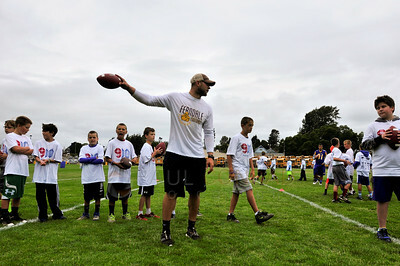 Tennessee Titans quarterback Jake Locker, right, observes youths during throwing practice of the Michael Koenen/Jake Locker Charity NFL Kids Football Camp at Ferndale High School in Ferndale, Wash., on Sunday morning July 20, 2014. The camp is held annually and is hosted by Locker and Tampa Bay kicker Michael Koenen, both graduates of Ferndale High School. 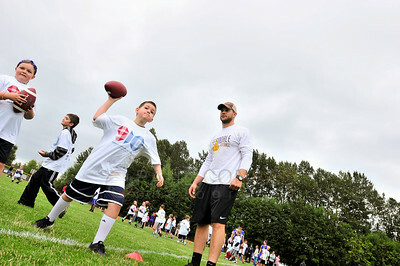 Tennessee Titans quarterback Jake Locker observes a youth during throwing practice during the Michael Koenen/Jake Locker Charity NFL Kids Football Camp at Ferndale High School in Ferndale, Wash., on Sunday morning July 20, 2014. The camp is held annually and is hosted by Locker and Tampa Bay kicker Michael Koenen, both graduates of Ferndale High School. 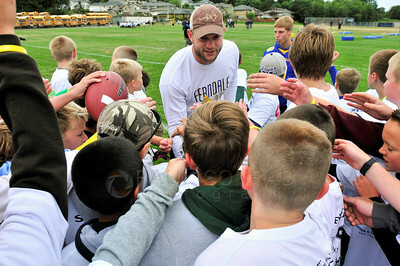 Tennessee Titans quarterback Jake Locker instructs participants during the Michael Koenen/Jake Locker Charity NFL Kids Football Camp at Ferndale High School in Ferndale, Wash., on Sunday morning July 20, 2014. The camp is held annually and is hosted by Locker and Tampa Bay kicker Michael Koenen, both graduates of Ferndale High School. 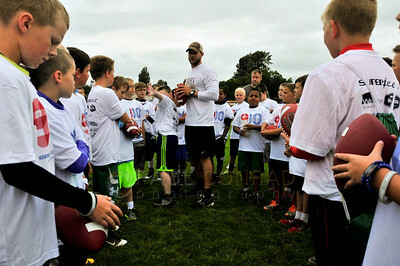 Tennessee Titans quarterback Jake Locker gives a pre-practice pep talk to youths attending the Michael Koenen/Jake Locker Charity NFL Kids Football Campat Ferndale High School in Ferndale, Wash., on Sunday morning July 20, 2014. The camp is held annually and is hosted by Locker and Tampa Bay kicker Michael Koenen, both graduates of Ferndale High School. 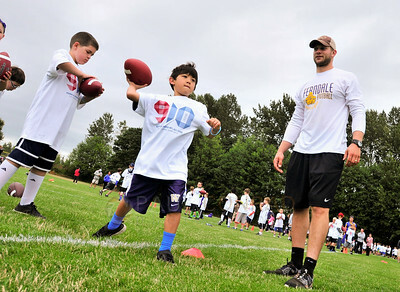 Tennessee Titans quarterback Jake Locker gets participants ready during the Michael Koenen/Jake Locker Charity NFL Kids Football Camp at Ferndale High School in Ferndale, Wash., on Sunday morning July 20, 2014. The camp is held annually and is hosted by Locker and Tampa Bay kicker Michael Koenen, both graduates of Ferndale High School. 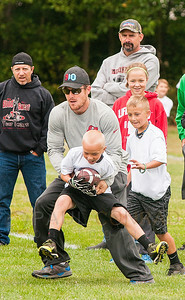 Tampa Bay Buccaneers kicker Michael Koenen tackles a youth while scrimmaging with youths during the Michael Koenen/Jake Locker Charity NFL Kids Football Camp at Ferndale High School in Ferndale, Wash., on Sunday morning July 20, 2014. 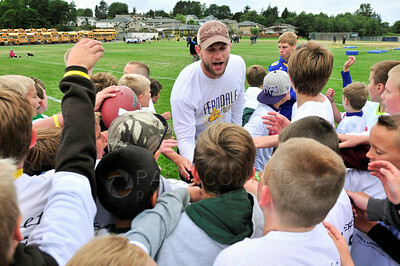 The camp is held annually and is hosted by Tennessee Titans quarterback Jake Locker and Koenen, both graduates of Ferndale High School. 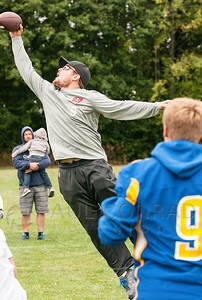 Tampa Bay Buccaneers kicker Michael Koenen reaches for, and catches, an errant pass while scrimmaging with youths during the Michael Koenen/Jake Locker Charity NFL Kids Football Camp at Ferndale High School in Ferndale, Wash., on Sunday morning July 20, 2014. 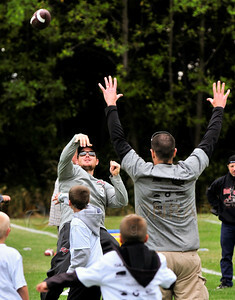 The camp is held annually and is hosted by Tennessee Titans quarterback Jake Locker and l Koenen, both graduates of Ferndale High School. 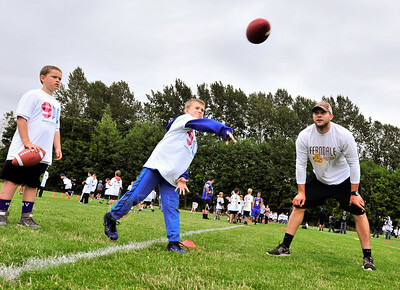 Tennessee Titans quarterback Jake Locker, right, observes Nathan Sosaya, 9, of Lynden, as he passes during the Michael Koenen/Jake Locker Charity NFL Kids Football Camp at Ferndale High School in Ferndale, Wash., on Sunday morning July 20, 2014. The camp is held annually and is hosted by Locker and Tampa Bay kicker Michael Koenen, both graduates of Ferndale High School. 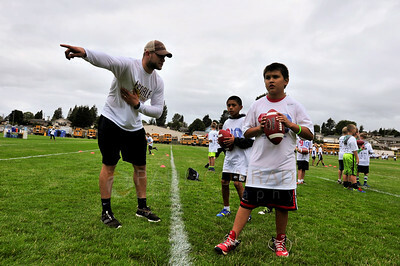 Tennessee Titans quarterback Jake Locker gives throwing tips and pointers to youths during the Michael Koenen/Jake Locker Charity NFL Kids Football Camp at Ferndale High School in Ferndale, Wash., on Sunday morning July 20, 2014. 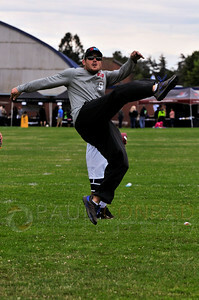 The camp is held annually and is hosted by Locker and Tampa Bay kicker Michael Koenen, both graduatews of Ferndale High School.